Councillors in Rotherham don't want to see the £55.7 billion HS2 project reach Yorkshire. In July 2017, the Secretary of State for Transport confirmed the preferred route for HS2 project from Crewe to Manchester and from the West Midlands to Leeds (known as Phase 2b). A stop at Chesterfield and a spur to Sheffield is included and the fast route to Leeds would go through the East of Rotherham. With further details recently released on the impact of the building of the route through areas of Rotherham such as Aston, Thurcroft and Bramley, a motion was put forward by the opposition group and debated at a recent full Council meeting. The initial motion was amended by the controlling group on the Council and seeks to call on the Government to abandon the Leeds leg of the project. 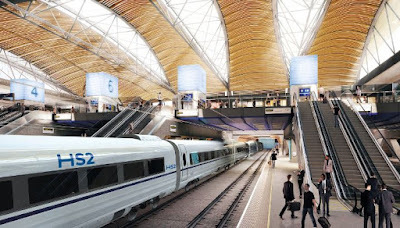 The initial motion was to call on the Government to cancel the HS2 project in its entirety. Members discussed their personal feelings on the project with many agreeing that the negative impacts, such as adverse environmental impacts and the impact during construction, outweigh the perceived benefits of the scheme. Members also want to see Government spending re-allocated to address more local transport issues. Rotherham Council's previous stance was a preference for the South Yorkshire HS2 station to be at Meadowhall on a through route to Leeds. During the debate, Cllr. Chris Read, leader of Rotherham Council, said: "We are not against the principle [of HS2]. When I talk to my colleagues in Birmingham, they are already seeing significant investment in the middle of Birmingham predicated on high speed 2 coming from London ... We talk to our friends and our colleagues in Chesterfield and they are already starting to see economic investment coming in, even with the plan - and I think it's the wrong plan - for this spur route, which won't deliver all the benefits to South Yorkshire. "The issue for the Birmingham to Leeds line, and the reason I think we feel shortchanged by it, and the Government needed to take money out by cancelling the Meadowhall option, is because the economic benefit has always been less for that part of the route. Because there are fewer people that make the journey. If it wasn't now for the city of Leeds and the demand from the Leeds / Bradford conurbation, it wouldn't be going ahead full stop. "They couldn't make the demand stack up on their own model for a South Yorkshire stop which is why we've not got one. So it would never get here, spur or no spur. It is the weakest economic case." Cllr Read added that the Council had met with the (now resigned) new chair of HS2 who admitted that the line to Leeds will definitely happen so long as there continues to be support for it and lobbying for it. Whilst bills for other phases have reached Royal Assent, bills for Phase 2b have not yet gone through Parliament and Cllr Read concluded that by showing opposition against the Leeds leg through Rotherham: "This is a fight that we can win." Here idea of new transport hybrid airship or hyperloop or even vote both. More Nhs hospital and dental. More primary school and college. More fire and police station. And vote anyway transport hybrid airship or hyperloop or even vote both. I find it sick to destroy Hoac & Hoac is my favorite activities . And it in harefield and I live harefield in year . And let me know if you want me to send poster about scrap high speed 2 And vote Hybrid airship or hyperloop or even vote both. Let me know if you want a poster from me.